One thing that our system doesn’t do very well, or at all, is deal with blends. Your inventory consists of “beans” which you can name as you wish and have a country of origin. In the case of a blend, right now we simply give you the liberty to name it as such and set the country of origin to “N/A”. However, this is all going to change drastically very soon. Readers of this blog or folks who keep with up via other means are most likely aware that we’re building a very sophisticated inventory system. The last nine months have taught us a lot about what we got right in our initial design along with what we got wrong. One thing is blends. 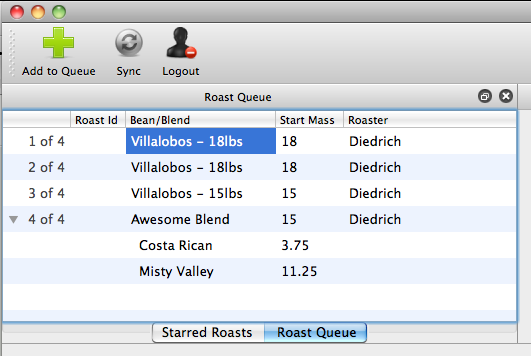 Folks who do pre-roast blending simply can’t track individual components with RoastLog right right now. Another thing we needed to improve on is allowing roasters the ability to treat the same bean for differently. A bean may be a bean, but when it reaches the roaster it can be roasted different ways to produce different results. To deal with this issue, we’ve come up with the notion of a “roastable“. A roastable comes from one or more of the beans you have in inventory and is simply something which you can put into your roaster. Someone has a Costa Rican Villalobos in their inventory which they roast in different batch sizes. Their inventory item is “Costa Rican Villalobos” (along with much more data about that bean. ) The user creates two “roastables”, “Villalobos – 15lb” and “Villalobos – 18lb“. This solves the issue of wanting to treat the same coffee differently when it gets to the roaster. While these are the same beans, different batch sizes may need different profiles in the roaster. In terms of inventory, these two items come from the same parent bean whose quantity will be deducted regardless of how it’s roasted. A roaster has their current “Awesome Blend” which consists of 25% Costa Rican and 75% Ethiopian (sure to be delicious). Both the Costa Rican and Ethiopian beans are separate inventory items. In RoastLog v2.0, you’re now able to create a new “roastable” which has multiple parent inventory items. In effect, you’re allowed to create a pre-roast blend. In this case, a user would create a new roastable named “Awesome Blend” and tell RoastLog what it consists of. When you boot up RoastLogger and add that item to your RoastQueue, we know its components and can display them, even telling you how much of each bean you’ll be roasting (25% of 15 is 3.75, in the screen shot). What all this means is that we can now give folks the ability to get very specific with what they put in their roasters and at the same time keep track of their inventory with fine-grained detail. Of course, this presumes that users actually enter the starting mass of each batch. I was a little very hesitant to introduce new terminology, but was convinced that this just makes sense. A roastable is something you roast, regardless of what it’s comprised of. Because we’re creating something new (powerful software explicitly for coffee roasters) there are going to be some new ideas which come along with it. The “roastable” is one of them.